It’s a punishingly hot Saturday and it seems like all the geeks in the Philippines have congregated at the Bayanihan Center. Their breed often falls into two categories: 1) the human teddy bears with their beards and plus-sized shirts; and 2) the Tado analogs with their spectacles and kanto boy humor. Of course, they’re all here because it’s Komikon 2016—our very own version of the San Diego Comic-Con, an event where all things comic books are celebrated. It is here where humble citizens—mostly aspiring hobbyists who have day jobs—bring to life the stories in their heads with only pen, paper, and Photoshop as their instruments. It is here where locally produced comics and zines (mimeographed booklets that champion collage art) are hawked side by side with publications by Marvel and DC. Indeed, there is much to celebrate. It is inspiring to see Filipinos embracing the DIY spirit and experiencing newfound freedoms in a medium miles away from the showbiz politics of mainstream media. Manix Abrera is the son of Jess Abrera, who worked with The Philippine Daily Inquirer as chief cartoonist and comics editor for 24 years. Yes, most of these comics were made in someone’s bedroom, folks. With not a lot of cash, but with a lot of heart. Look closer and you’ll see that the local comic book scene has come a long way since the Golden Age of the pulps (with its two godfathers, Carlo J. Caparas and Mars Ravelo) and ’90s heavy-hitters Pugad Baboy and Pupung. The booths at Komikon are a testament to a new spectrum of material—from manga-inspired shoujo romances to the best-selling Trese series and its many aswang-hunting derivatives. But if you’re observant enough, you’re likely to spy a new subgenre of Filipino comics—one where the line work is squiggly (as if Matt Groening had a child with Larry Alcala), the characters are bug-eyed, and the humor skews towards puns or acute observations of the middle class. Manix Abrera with his works hung on the wall. 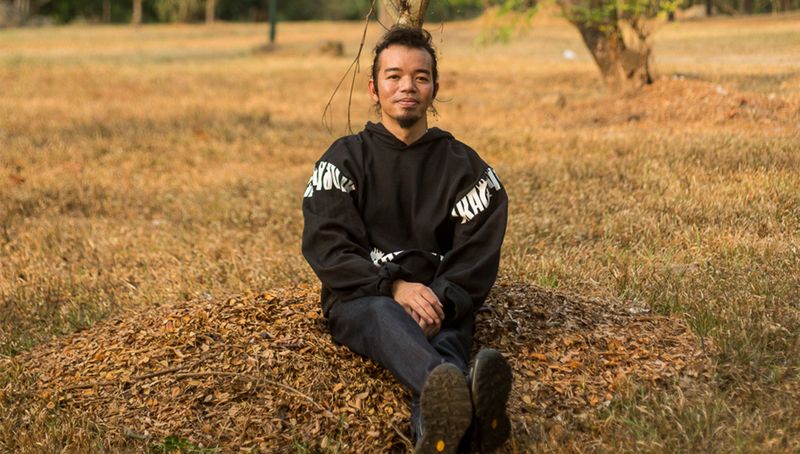 Enter Manix Abrera—perhaps, along with Apol Sta. Maria, the poster boy of this style. What do we call it? Manapol? Jeje-Hipster? Post-Polgas? “I started drawing when I was four or five years old. My dad was a cartoonist, and I would always sit beside him and draw,” says the goateed and soft-spoken Abrera. “I am very happy with my job because I get to do comics full-time. At the start, there were struggles, but if you love what you do, you will surpass all obstacles. I don’t have a regular schedule, as long as I meet my deadlines,” he says. At the Galerie Stephanie in Libis, Abrera is hosting his own art exhibit called Bukal sa Puso ng Lagim. On the gallery’s walls are framed original pages of his works in comics—a novel thing in the art-collecting scene, given that most pieces that get exhibited are paintings and sculptures. It’s mostly my Kikomachine strips that made it to the show. I focused on strips that had themes of love. But hopefully, aside from the themes of love, I was able to show the wide range that Filipino culture has,” he says. In a corner of the function hall is a tarp announcing Manix Abrera’s latest graphic novel. The Komikon crowd takes selfies in front of it as artists hunch over their lapboards, whipping up fan art and caricatures. At the Bayanihan Center, it feels like you’re in a colony of pen-and-paper people, and it makes you feel alive. No small thanks to people like writer and illustrator Manix Abrera. This story was originally published in Northern Living, May 2016.